During this session we will discuss aspects of healthy friendships and how to recognize when they are not. Jennifer will lead our group in some Asana Yoga, meditation, and breath work. 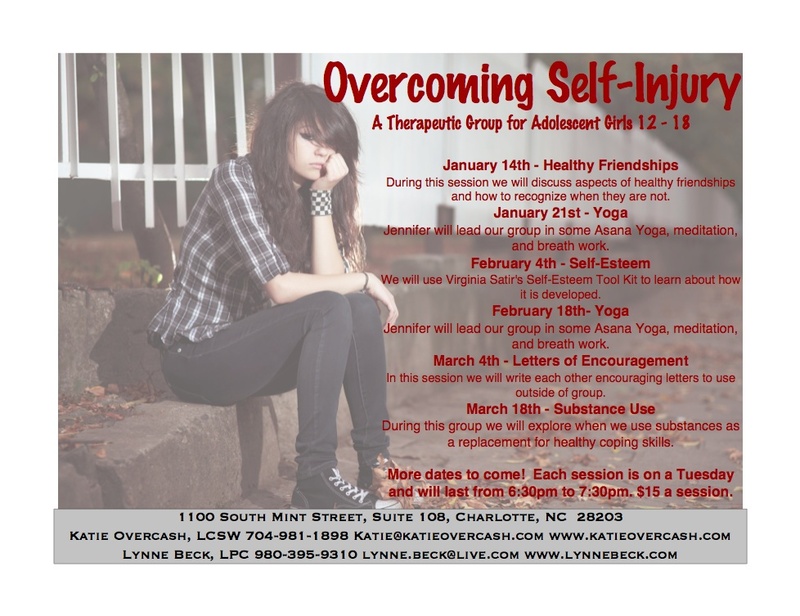 We will use Virginia Satir’s Self-Esteem Tool Kit to learn about how it is developed. In this session we will write each other encouraging letters to use outside of group. During this group we will explore when we use substances as a replacement for healthy coping skills. More dates to come! Each session is on a Tuesday and will last from 6:30pm to 7:30pm. $15 a session. If interested in signing your daughter up, please fill out this FORM. This entry was posted in Uncategorized and tagged Anxiety, Charlotte North Carolina, communication, Coping (psychology), coping skills, cutting, depression, girls, Mental health, self-esteem, self-injury, yoga on December 18, 2013 by katieovercash.